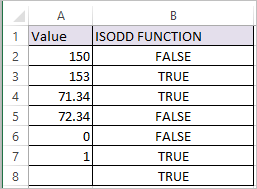 ISODD Function in Excel tests if a supplied number (or numeric expression) evaluates to an odd number, if so then the Function returns TRUE, if not the function returns FALSE. Where value argument is the Expression or value to be tested for odd number. 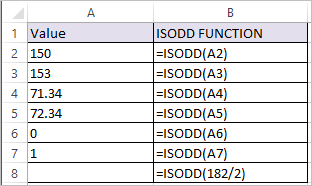 Excel ISODD Function, also considers odd Decimals as odd numbers. So 71.34 is considered as odd.